Another card from special request! Yay! This card was made for Yasmin's 23rd birthday, requested by her BFF, Dewi! 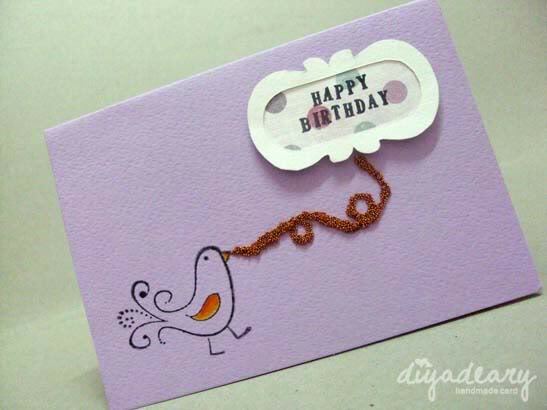 Dewi wanted a purple card with simple design more or less, looks like the Birdie Loves. I'm using the micro-beads, given by Dewi herself as the connector between the bird and tag! It was my first time handling the micro beads by the way. It was not easy though. So, this was the result of the card. Yes. It's a simple birthday card. But, I love it! The best part was - the card flew to Australia. Yuhuu. Happy Belated Birthday, Yasmin! And, of course, thanks a lot Dewi! !